What Can The Artisan Do? What Are Customers Saying About Artisan? What’s The Price of The Artisan? Everyone who loves to cook is usually ecstatic about getting a new kitchen appliance, and one appliance that every kitchen should have is the KitchenAid Artisan 5-Quart Stand Mixer. Whipping up that special meal or pastry for your family is a great way to show how much you care, but that doesn’t mean you want to be in the kitchen all day long either! Owning a multi-purpose appliance, like the KitchenAid Artisan, will make the time you spend in the kitchen a pure joy. KitchenAid is a brand that is trusted by the entire world and they have been in business since 1919 when they made their first stand mixer called the H-5. The company was determined to help revolutionize time in the kitchen as well as make it more fun. Their quality craftsmanship and versatile technology is the same today as it was then. In their humble beginnings they actually sold their stand mixer in hardware stores and eventually door to door. Soon KitchenAid was known to almost everyone as a product that was durable and a must-have in the kitchen. The KitchenAid Artisan 5-Quart Stand Mixer is just one piece of equipment, yet it has so many functions to help you in the kitchen. It’s quick and easy to mix up a huge batch of cookies when the kids tell you at the last minute they need them for school tomorrow, or to quickly mix up some dough for home-made bread when you find out unexpected company it coming to dinner in two hours! 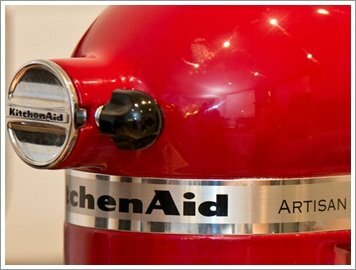 It doesn’t matter what the mixing, beating, or kneading problem is the KitchenAid Artisan can handle it with no problems! Once you own one you will find hundreds of uses for it. The pros to the KitchenAid Artisan are that is comes complete with three attachments. The flat beater is great for any kind of cake batter or even meat loaf while the wire whip works best for egg whites and recipes that need that air-infused fluffiness. Last, but not least, is the hook for mixing and kneading dough. You can make quick work out of large bowls of dough for breads or thick dough for chocolate chip cookies with this attachment !. We also think the extra-large pouring shield makes getting your ingredients in the bowl a lot easier. The entire stand mixer takes up a little more than a square foot so you will want to clear a spot for it. This is one piece of equipment you will use regularly so it needs to be kept out and ready. Finding a con about this unit wasn’t easy because it does everything the manufacturer claims it does, but if we had to pick something it would be this. Every once in a while when mixing something heavy like dough, the mixer tends to “walk” on the countertop just a tiny bit. 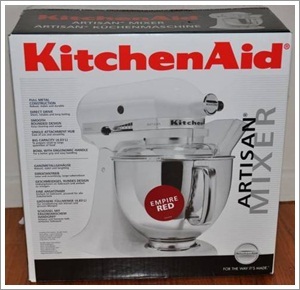 What Are Customers Saying About The KitchenAid Artisan? Well, I finally went for it and I have absolutely no regrets. You want to talk about a solid piece of kitchen machinery? This is the epitome of what “Made in America” used to mean! The different attachments are very easy to attach and remove. It would be impossible not to love it! Did I mention how easy the clean-up is? I love it so much I bought the KitchenAid quilted cover for it. Once you use this mixer you will never want to use anything else! The Best!!! Overall, I would highly recommend the Artisan mixer. It’s powerful enough for the heftiest mixing jobs, and was thoughtfully designed with the practical cook in mind. Customer remarks have been paraphrased to save space. The suggested retail price of the KitchenAid Artisan is $350* and it is well worth it; however we found it for a lot less online. For about $270* you can order this mixer in white and have it shipped to you absolutely free. This mixer does come in 24 different colors but you will pay around $70* more for choosing anything other than white. In conclusion we would like to say that the KitchenAid Artisan 5-Quart Stand Mixer appears to be one of the favorite stand mixers on the market today. KitchenAid has made yet another great product that is built to last and one that can make time in the kitchen easy and fun. Our suggestion is for you to purchase the mixer online so you can take advantage of the lower price and the free shipping as well. The price on the mixer may seem high but once you realize what a workhorse the Artisan is you will understand why. Although you will pay more for a specific color, we have never seen any product with 24 color choices to pick from. You should not have a problem matching any décor and color of your home. We highly recommend the KitchenAid Artisan stand mixer and hope you will take a closer look for a new one.